One can get many interesting and useful things from paper. 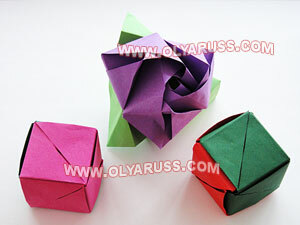 Origami helps to do such creative work. This video lesson tells and shows how to make an interesting cube. 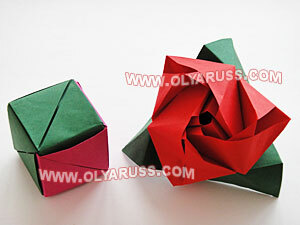 This cube is a transformer, because it can be a cube or a flower rose. You need 6 (six) square pieces of paper to create such handcraft. Three of them may be red or pink and the rest three of them are green. So, prepare 3 (three) red squares and 3 (three) green ones. Choose a paper size yourself, but all square pieces must be of one size. For the video I have used a paper of 15cm x 15cm. The paper size used for the cube - transformer in photos is 15cm x 15cm too. In the process of the creative work every paper square will become an origami module, which then you will combine into a cube. Use the video description to create the real cube - transformer.